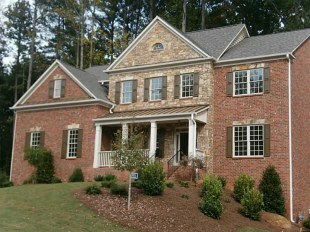 Cobb County homes remain at this fabulous community located in East Cobb of of Oak Lane. This enclave of only eight homes is the perfect community for families looking for privacy and location. Luxury new homes at Marston Park are priced from the low $700,000s. Located on homesite one, the first home features the Marston floor plan and is priced at $731,100. This spacious plan boasts five bedrooms, five bathrooms, a two-and-a-half car garage and a basement. Elegant interiors highlight upscale features and finishes including a gourmet kitchen, large family room with deep coffered ceiling, hardwood floors, and roomy secondary bedrooms with private bathrooms and walk-in closets. Priced at $721,200, the second home showcases the fantastic Providence floor plan on homesite seven. As one of the most popular floor plans, this home is sure to sell fast! On the main level this home features a guest suite with full bath and keeping room with cozy fireplace. Double ovens, stainless appliances and a large island are just a few of the features in the gourmet kitchen. Other appointments include spacious bedrooms, media room and laundry room on the second floor. Marston Park’s East Cobb address puts residents in close proximity of the area’s best fine dining, shopping and recreation. Children at Marston Park also receive an exceptional education attending Tritt Elementary, Hightow Middle and Pope High schools. Traton Homes website for more information.